Warner Bros. Special Events | Book your next event with us | Bar Mitzvah Warner Bros. 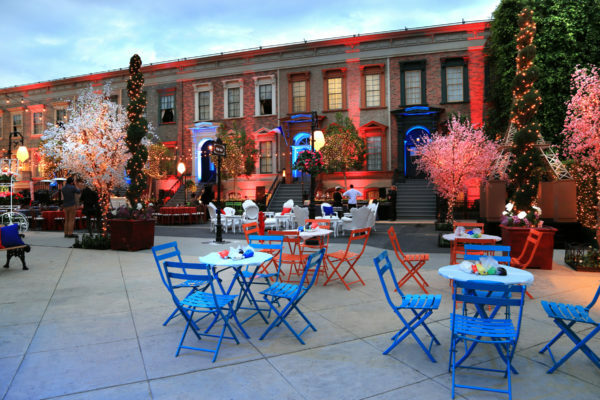 This was a bar mitzvah celebration that truly took advantage of the spirit of Warner Bros. as an event venue, a working movie studio and an event producer. 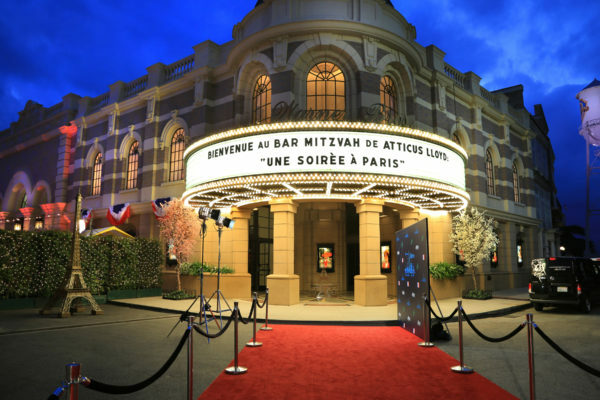 It began with a red carpet arrival with the marquee of the Steven J. Ross Theater greeting guests with an event titled “Une Soiree A Paris” in lights. The carpet was staged just as it would be for a movie premiere with stanchions on either side and a custom step-and-repeat wall for photos opportunities. 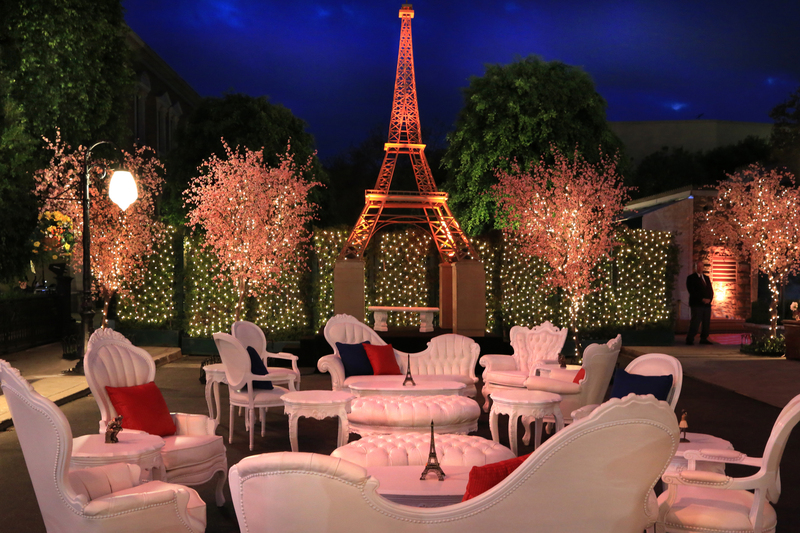 Outside the theater the experience began with a replica of the Eiffel Tower set amid café tables, French lamp posts and cherry blossom trees. 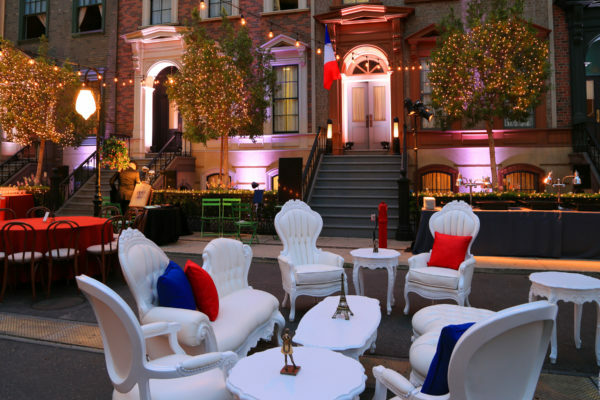 Guests stepped through the SJR lobby onto Brownstone Street and into a Parisian street scene. Bistro lights, lamps posts, festive lighting in the doorways, fountains filled with flowers, flower carts overflowing, bistro tables and chairs all set the stage for a night in the City of Light. The mimes from the red carpet joined the festivities as did French singers and Moulin Rouge dancers. The birthday boy himself performed a cabaret number he had had rehearsed with the dancers. 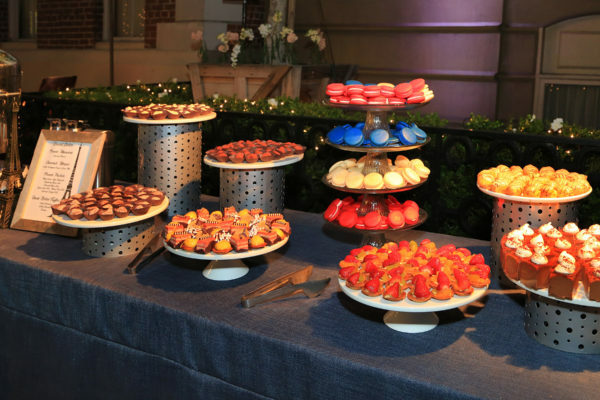 There were also interactive activities including a cookie decorating station where guests could add colored icing to cookies shaped as Eiffel Towers and hot air balloons. Cuisine was of course, French. For the kids, there was a Grilled Cheese station offering five variations on this classic sandwich from Croque Monsieur to Brie and Green Apple. 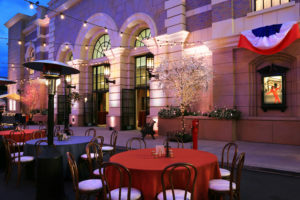 Other stations offered Halibut Nicoise, Grilled Lemon Provencal, Pommes Puree, and desserts featuring all French delicacies from macarons and mousse to eclairs and truffles. The activities were fun and very French. There was a Beret station at which guests could have their name embroidered, a crepe station, and a cookie decorating area. And as the hour grew late, the most exciting surprise a 13-year-old-canimagine appeared — the French Fry Truck!